Of course I don't mean what I say in the title. 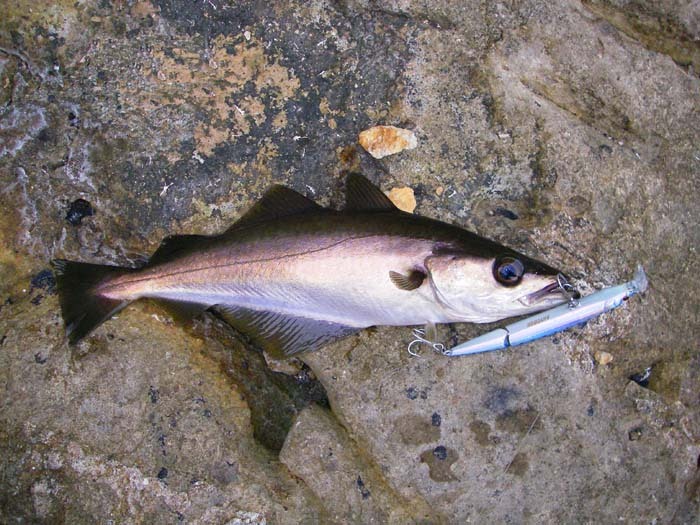 Some lures suit particular conditions and particular species of fish better than others. However, the other morning my pal Rob and I had decided to have an early start. As we walked to the shore in the dark we were each carrying three rods. 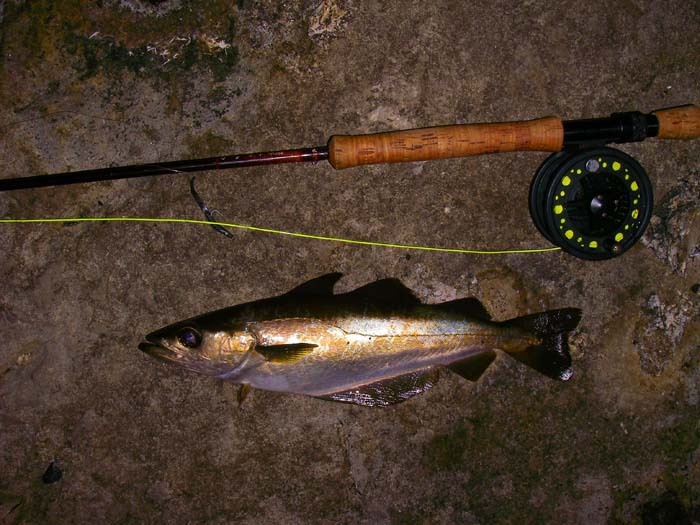 A fly rod with a floating line and a suitable 'fry fly' (Rob) or Delta Eel (me), a spinning rod with a plug (Rob) and a Redgill(me) and a livebait rod with a circle hook (both of us). It wasn't that we were prepared for all eventualities but simply that we enjoy catching fish in different ways. On arrival we each began operations, in darkness, with the fly tackle. We probably fished for five or ten minutes before the pollack started to bite. My little black Delta seemed to be the favourite at first and I landed three bigger than average pollack in quick succession before Rob had one on his Clouser. At this point I decided to switch to the spinning rod with an 18cm, pearly Redgill - I suppose I was hoping to tempt a bigger pollack. It was at this point that the bass began to bite and within minutes we were both into bass. Between us we had bass on flies, Redgills and shallow divers. 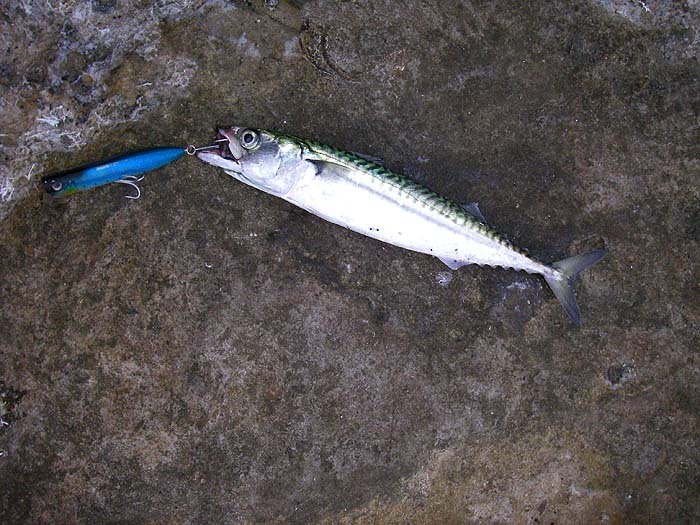 I put a Yo Zuri slider on the spinning rod and promptly caught a mackerel which was transferred to the freelining rod. My livebait proved to be a bit of a pig and persisted in burrowing into the weed so, after a little while, I returned to catching fish on a plug. All in all I don't know how many fish we caught in the hour-and-a-half or so before we packed in but if variety is the spice of life we certainly had plenty of spice. 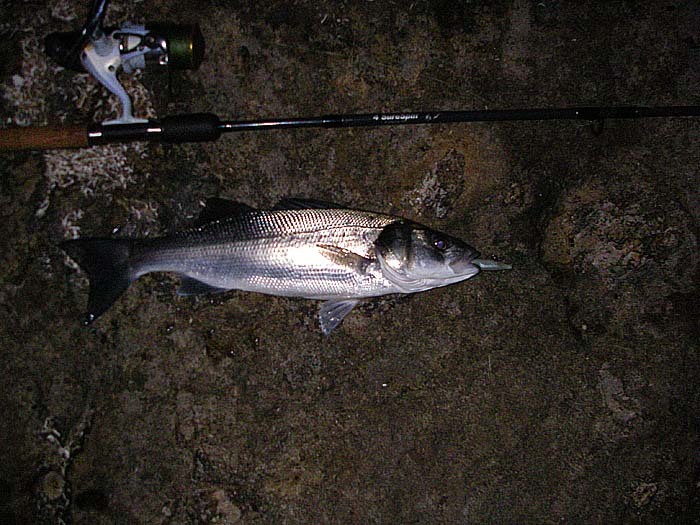 Even as we were having our 'last casts' the pollack continued to bite, although less keenly than at first. As I've suggested there was the usual sequence of pollack - bass - mackerel as dawn broke. As it got light it became pot luck what was going to take the lures. Many of the fish that we caught were coughing up whitebait as we unhooked them. 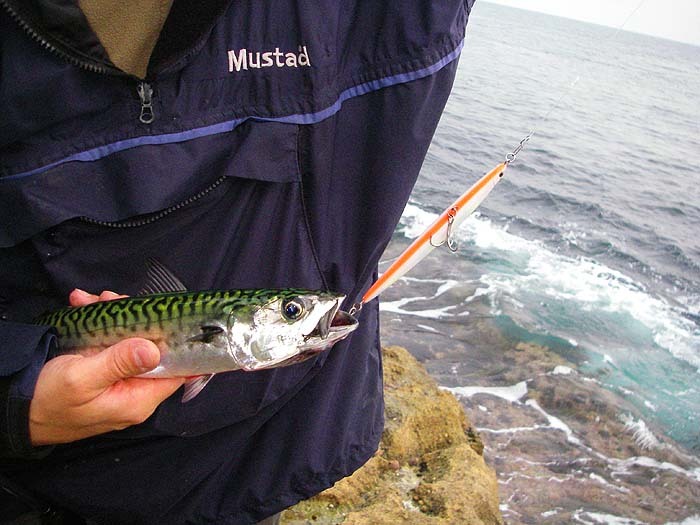 There's no doubt that, had we tried them, we could have caught fish (probably a lot more mackerel) on metal lures as well. We both agreed that it had been an excellent session and well worth getting up for.